I can just imagine us thousands of years ago, as the 12 tribes of Israel stopped their warfare in order to pray to the Creator of the Universe. Is this what makes us holy? Blessed be The G-D of Israel who alone does Mighty deeds for His chosen people Israel. I am not Jewish but I have no question in my mind and in my heart The Holy One of Israel is with His people Israel. 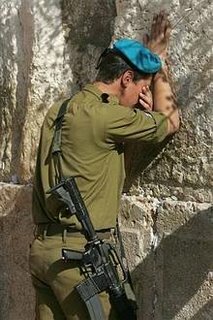 This is such a wonderful video especially when I see the Israel Soldiers praying and reading the Holy Word of G-d.
May The G-D of Israel bless and protect His chosen people, and all who fear the G-D of Israel with His Shower of blesssings from above may The Great I AM fufill our your hearts desire may He answer all your prayers, and may The Holy One of Israel give you Shalom. Exquisite, Tamar. With your kind permission, I hope to post it at the Beams. May our dedicated soldiers and our wonderful people Israel all be inscribed in the Book of long and happy Lives for unlimited blessings in our treasured land of Israel, amen. Warmest regards from Ashdod. Moscow -- U.S. filmmaker Oliver Stone, who surprised many with the patriotic flavour of his new film World Trade Center, hinted in Moscow yesterday that he is considering a more controversial follow-up investigating the "conspiracy" around 9/11. "There is a great story in a movie, a conspiracy by a group of people in the American administration who have an agenda and who used 9/11 to further that agenda," he told journalists in Russia. There could be a "fascinating project [on] what happened after Sept. 11," the director said at his packed press conference on the fifth anniversary of the attacks. Do It For A Soldier !